Finding good gifts for your kids? Not so easy right? We try to keep things fairly simple in our house...Santa brings the kids a big toy/thing, so our gift is a savings bond (I know we're crazy like that) and one other thing (this year I'm also making something for each kid in addition to their one thing). Last year their "one thing" was a coupon book of experiences. The things in the book were mostly things we do already (game night, walk for ice cream, sledding, trip to the zoo, etc.) with a few special things mixed in (trip to the Shedd Aquarium, camping in the backyard, Milwaukee Wave game, paint your own pottery) and a couple things that would be first time experiences (fly a kite, movie for EJ, batting cages for Jack). Jack and EJ each got a book and when they wanted to do something from the book, they would tell us and we would schedule it immediately. Not necessarily do it immediately, but schedule it! When completed, they would put a sticker on the coupon. Huge hit! During the Winter months, the books were great to keep us active and doing things. We left them out where the kids could access them and they came to us with ideas all the time. During the summer, we definitely let them go a bit, but I just went through them again this week and we actually did the majority of the summer activities in the books! Each kid has 4 unused tickets at this point (J-batting cage, build a snowman, fly a kite, beach day; EJ-build a snowman, Midwest Twisters, petting zoo, beach day)...not too shabby! The best part was that the gift was all about spending time together as a family or parent-kid pairs and, much like our geo-caching, it's not about what we're doing, it's about that time together! 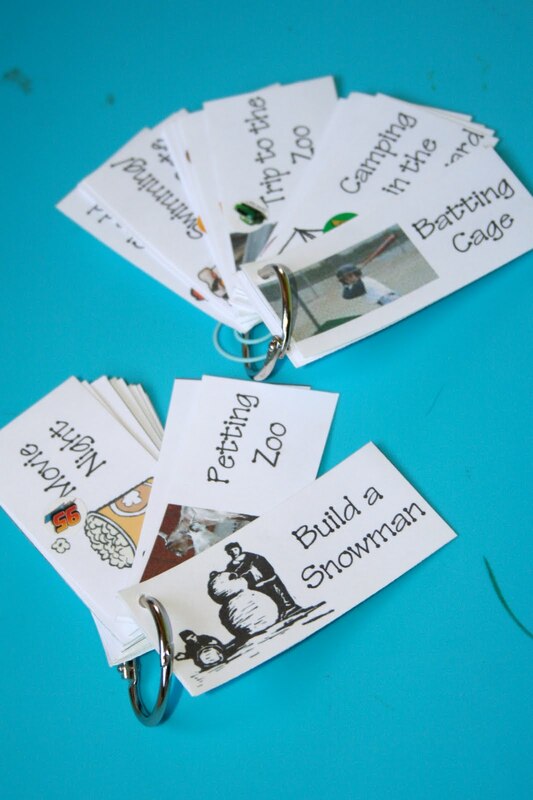 The "books" were pretty easy to make...first about 2 weeks of brainstorming ideas and trying to make the lists even, then searching for clip art images or photographs for each one. Finally I made & cut the tickets, hole punched them, and put them on a binder clip (Jack's has that extra blue spiral clip so we could tell them apart). Easy peasy! In full disclosure, I should admit that St. Nick visits out house on December 6th (does he come to your house too?) and my kids don't get a lot of candy, so he may spoil them a bit then (don't worry, I'll share pics of their loot). Have you seen the Fisher-Price Stack Around Silly Town playset? I have been eyeing it for my 6 month old and maybe Liv would like it too! It is actually in the Target Toys Catalog on sale for 40 bucks but there are other accessories you could buy with it. Just a thought. Thanks so much for sharing, Heather! The coupon books are awesome! Sadie - I just used a white cardstock and they held up really well...the cards are pretty small (like 1x3"). You could maybe use something like Moo cards (is that what their called?) too. Thanks Carrie! I could definitely use a good idea...she's just 7 months (so 8-9ish months at Christmas).